Fiorentina coach Stefano Pioli visited his former club Lazio on Sunday when the Biancocelesti hosted La Viola in Rome. It made for an entertaining game between two really good attacking sides. Obviously, with all the good attacking players on the pitch, the game was decided by a corner where Ciro Immobile turned in the only goal of the game. 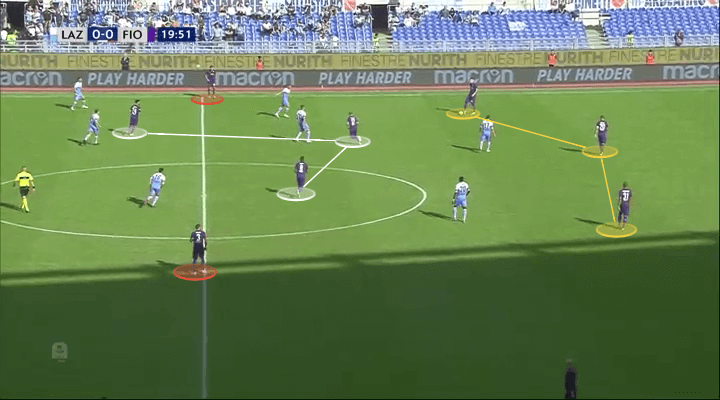 This tactical analysis looks at the trends of the game with the focus on Fiorentina’s interesting set-up. Simone Inzaghi used his normal 3-5-2 but opted for two strikers rather than an attacking midfielder behind Ciro Immobile. Thomas Strakosha played in goal behind a back-three of Wallace, Francesco Acerbi and Stefan Radu. The midfield three was Lucas Leiva behind Sergej Milinkovic-Savic and Marco Parolo. Adam Marusic and Senad Lulic started as wing-backs and the attacking duo was Immobile and Felipe Caicedo. Fiorentina have a very fluid system under Pioli but let’s call their formation 4-3-3. They started with Alban Lafont in goal behind a back-four of Nikola Milenkovic, German Pezzella, Vitor Hugo, and Cristiano Biraghi. Jordan Veretout anchored the midfield three behind Marco Benassi and Gerson. Federico Chiesa and Marko Pjaca flanked Giovanni Simeone in attack. Fiorentina’s sporting director Pantaleo Corvino has assembled a squad which has the youngest average age in Europe’s top five leagues. They have plenty of talent with players like Milenkovic, Chiesa, Simeone, Gerson, and Pjaca particularly standing out. Head coach Stefano Pioli uses a very fluid system to get them to thrive and I’ll look at it below. When defending, Pioli pushed his team forward and tried to press Lazio high up the pitch. They did this with clear man-orientations in their pressing. As you can see below, Fiorentina pushed the ball-far winger and Benassi high with Simeone to pick up Lazio’s centre-backs while the ball-near winger picked up Lazio’s wing-back. In midfield, Gerson in this situation marks Leiva. 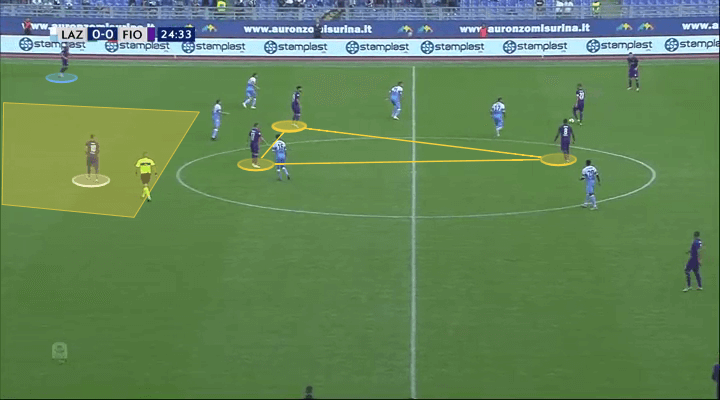 This pressing-scheme stopped Lazio from building from the back efficiently and forced them into playing longer balls. This is not something Lazio are averse to using to progress up the pitch; they often let Milinkovic-Savic act as a target for long balls. But Fiorentina were well-prepared and the Serbian right-back Milenkovic more than matched his compatriot in the air. Lazio, therefore, struggled to get control of the game due to Fiorentina’s defensive approach. When not pressing high, Fiorentina settled into a 4-4-1-1 or 4-5-1 shape depending on the position Benassi took up. Sometimes, like below, he stayed in front of Gerson and Veretout and effectively marked Leiva. In other situations, he moved deeper as Veretout picked up a deeper covering position behind Benassi and Gerson. While Fiorentina’s defensive setup was quite standard their attack was a lot more fluid and intriguing. Fiorentina changed their formation significantly in attack. First of all, the left-back Biraghi (white) pushed high on the left with the left-winger Pjaca (yellow) moving inside. On the opposite side the right-back Milenkovic stayed deeper to create a back-three while the right-winger Chiesa (white) stayed wide. 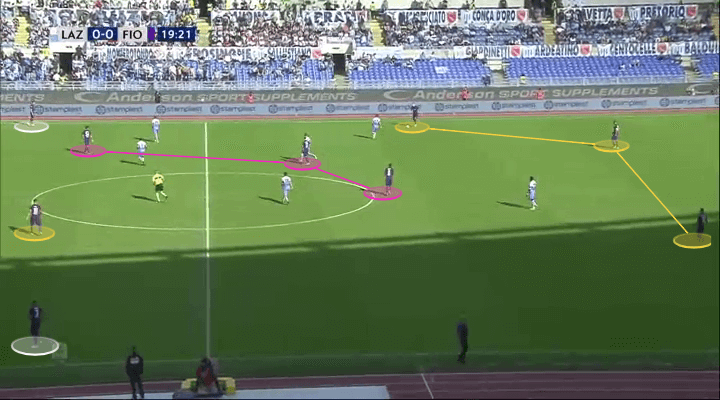 Veretout was the deepest of Fiorentina’s midfielders but Gerson also often moved deep to get on the ball while Benassi moved higher and looked for space behind Lazio’s midfield. You can see almost the entire shape below. In the image, it looks like a 3-4-2-1 in possession but it was very fluid and looked 3-5-2 on other occasions. It all depended on the movements of the midfielders and Pjaca. This made it all very flexible and hard to deal with for Lazio. Below is another example with a situational back-three established while the midfield three move around and pick up different positions. We can see Chiesa wide on the right and Biraghi on the left. One key to Fiorentina’s quality in possession was their ability to find space behind Lazio’s midfield. Pjaca timed his movement inside well and found very good spaces. Here I’ve highlighted him in plenty of space behind Lazio’s midfield. 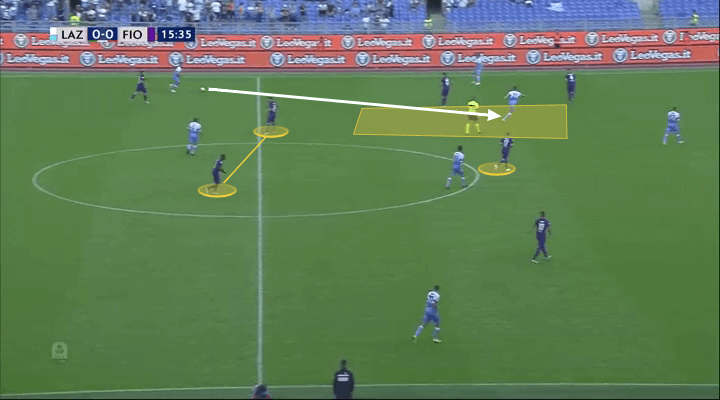 I’ve highlighted the Fiorentina midfield again, this time with Gerson as the deepest player. Wide on the right is Chiesa (sky blue) providing width and a very dangerous outlet with his 1vs1-skillset. Fiorentina have a very well-balanced midfield with Veretout’s craft and passing ability at the base with Gerson’s all-round quality and dribbling to his left and the energetic and clever Benassi to his right. The most exciting thing about La Viola though is the front three. Pjaca and Chiesa often swapped roles with Chiesa then appearing centrally with Pjaca wide on the right. Their skill and creativity match well with Simeone’s superb movement and it will be interesting to watch them as their combination play will improve with more time together. Despite a good away performance from Fiorentina, Lazio proved too strong. You got the sense Lazio’s experience and quality told in the end as they saw out the win. Inzaghi also opted for a high-pressing approach to disrupt Fiorentina’s build-up. They used their front-two against two of Fiorentina’s defenders while the right-back Milenkovic was pressed by Milinkovic-Savic who left his position in midfield to press. Lazio didn’t have a good back-up to their press, however, and Fiorentina could have exploited this more. With more composure at the back, Fiorentina could have beaten the press more often. A good example is below where Veretout has acres of space behind Lazio’s press but Milenkovic opted to go back to Lafont who sent the ball long. Lazio had succeeded with their pressing. Lazio use their midfielders very differently to Fiorentina. Leiva is supposed to start attacks from the base of midfield but the roles of Parolo and Milinkovic-Savic in attack is to push forward and attack behind the defensive line and in the box. Therefore, they push up quite high and are seldom marked by opponent midfielders. You can see Milinkovic-Savic below, he’s higher up than the two strikers. In the below situation, Wallace finds Caicedo who instantly lays it off to Parolo who has plenty of space behind Fiorentina’s midfield. In this way, Lazio managed to create free men behind Fiorentina’s midfield line. The half-spaces became an important area for Lazio when they tried to progress the play centrally. Below, Milinkovic Savic finds space in the left-sided half-space with both Benassi and Gerson caught high up. Veretout has too much space to cover and Lulic could easily have found Milinkovic-Savic in a great position. In terms of creating chances, Lazio looked to create through crosses. I’ve already mentioned the eagerness for Milinkovic-Savic and Parolo to get forward and this is demonstrated superbly by the scene below. Lulic sends a cross towards the box and four Lazio players attack the box centrally with Marusic also attacking the far-post area. In these situations, Lazio are heavy and tough to stop. The only goal came from a corner and it was no surprise given the power and strength of Lazio’s side. Lazio eventually won an even game 1-0 but Fiorentina impressed. The result was important for Lazio after last weekend’s derby defeat. Fiorentina once again showed their potential but have now lost narrowly at Lazio, Napoli, and Inter. Perhaps their inexperience might prove a bit costly in the battle for European places this term but in the long run, everything looks bright in Florence.